Have you seen the movie ‘Inside Out’? The movie is about feelings and emotions, a prominent topic in our house at all times. 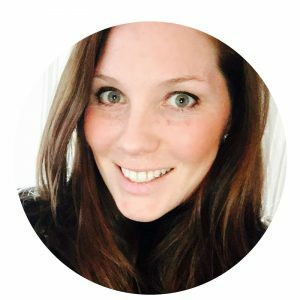 Raising spirited kids, I am constantly discussing feelings and appropriate ways to deal with emotions. This is usually discussed in our calm down corner, but I also try to talk about them through play. 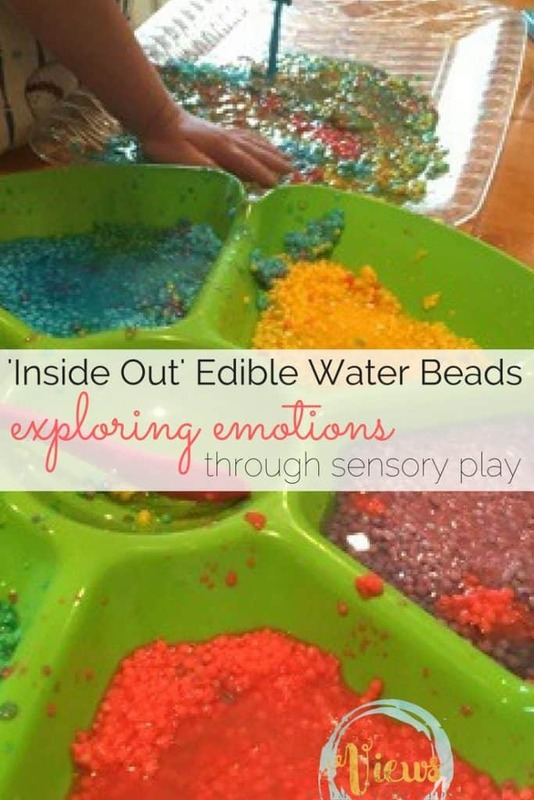 Sensory play is so important for kids for many reasons, but it also provides a great opportunity to discuss a number of topics. 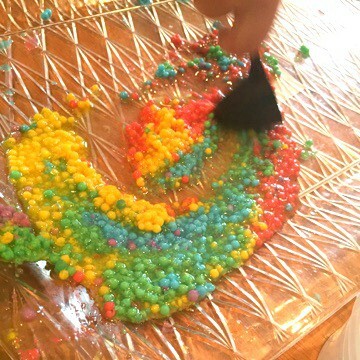 We love water beads in our house, but when trying to accommodate for a number of ages, water beads aren’t always an option. 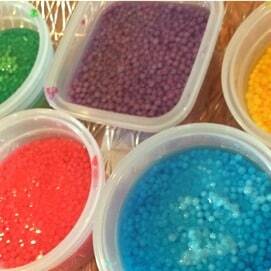 These edible water beads are the perfect activity for 1 year olds as well as older children, are are super fun! Pour some of the tapioca pearls into 5 different bowls (one for each emotion in the movie). 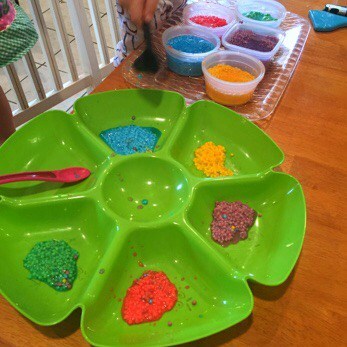 Add water to the bowls so that the pearls are completely covered and add food coloring (blue, yellow, green, purple and blue). Once the pearls have absorbed the water and have grown in size they are ready to play with! I left them to soak for about an hour. 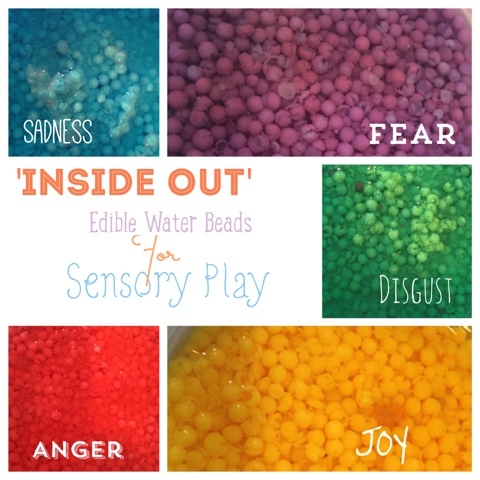 At this point you can drain the excess water, they will retain the color, or you can play with them in the water for a different sensory experience. These are a bit more delicate that regular (non-edible) water beads so they will get mushy if squeezed too hard by little hands, but are great for scooping and pouring! 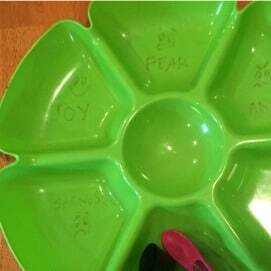 I then took a chip tray that I purchased at the dollar store (and use for a number of activities) and labeled each section with the emotion along with a simple picture. 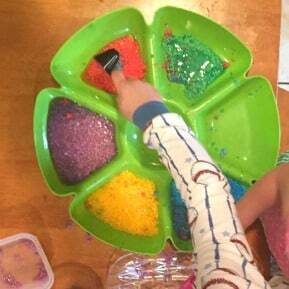 The kids first sorted the colors into the correct section of the tray. We worked on reading the words, discussing the emotion, and scooping and sorting! Once the ‘learning’ segment of our activity was over the kids went to town with the true sensory play! The squeezed the little balls between their fingers, smelled and tasted the tapioca and played with the mixture for quite a while! This post has been updated from it’s original version in July, 2015.